On the heels of yesterday's blog post, where I discussed the importance of keeping cats INDOORS, it is appropriate that I present to you THE ONLY book you will EVER need to help you create an indoor utopia that will not only provide hours of entertainment for your cat(s), but it will enable you to design that utopia based on YOUR cat's needs (after all, they ARE ALL DIFFERENT!). You will learn how to do this by using design choices and ideas that are unique and personal to YOUR home decor! From Fuzzytales:when the cat is indoor-only and doesn't have access to a catio or something similar, I think it's hugely important to make the living environment as enriching as possible. It's not just about having a cat live into its teens or even to 20, it's about *quality* of life as well. Want to make YOUR cat's environment "as enriching as possible?" 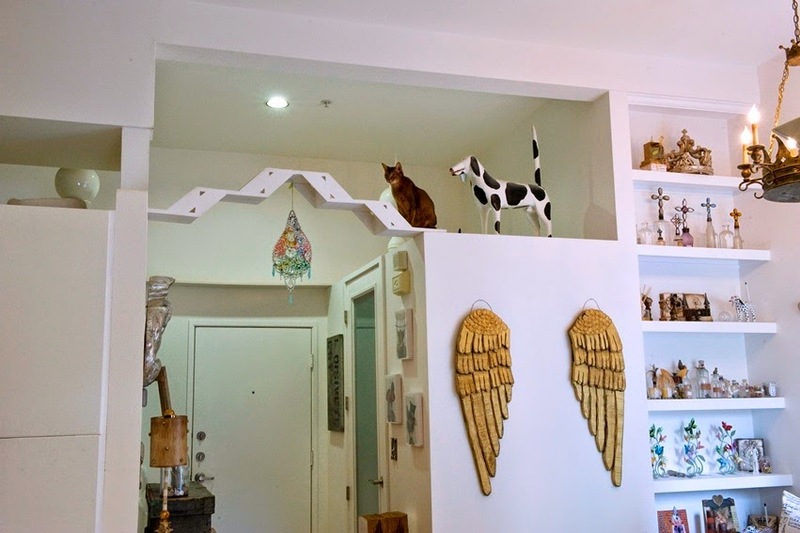 Catification is about creating feline-friendly environments that cater to a cat’s natural instincts to climb, perch, rest, play, and own their space. 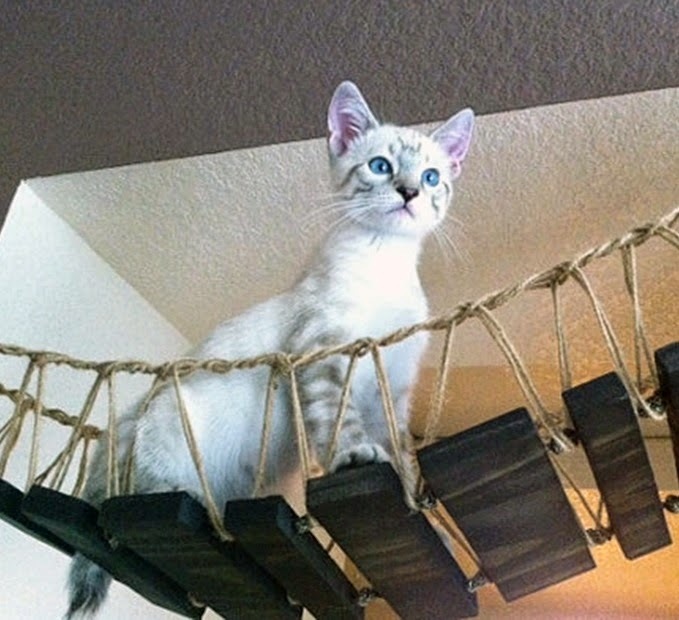 We’re here to tell you that you can accommodate your indoor cat’s need to climb, perch, play and relax — in a way that makes you both happy. According to JACKSON GALAXY, the star and executive producer of Animal Planet’s My Cat from Hell and author of Cat Daddy, you don’t have to choose. 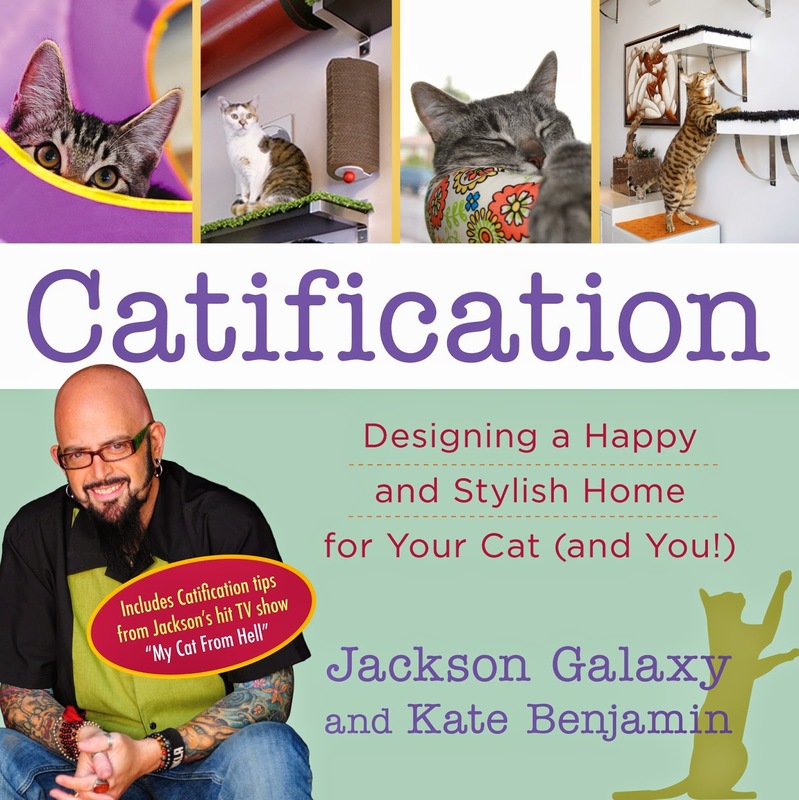 In CATIFICATION: Designing a Happy and Stylish Home for Your Cat (and You!) (Tarcher/Penguin paperback; on sale 10/14/14), Galaxy joins one of my favorite "Cat Women", Kate Benjamin, of the popular cat website Hauspanther.com to help cat owners everywhere design a happy feline home that is both functional and chic. 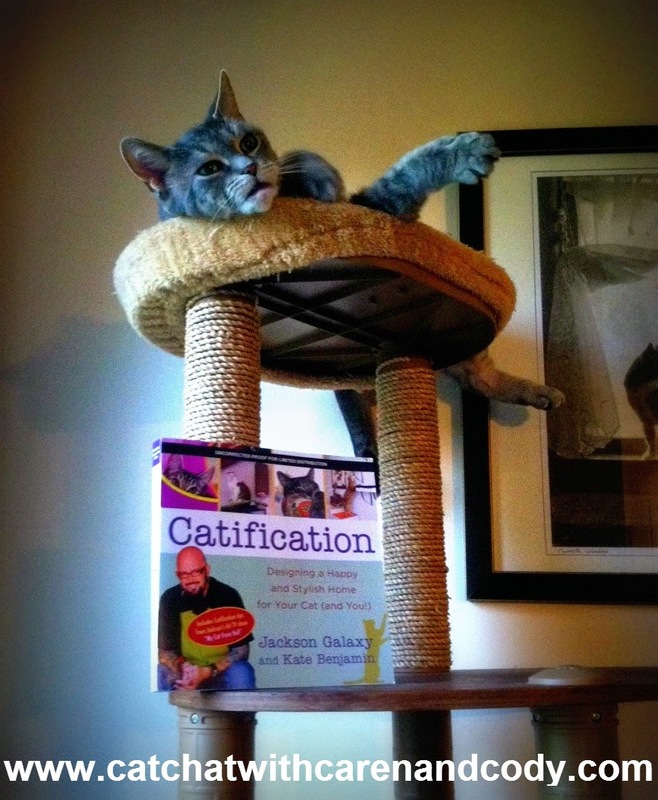 Kate Benjamin the reigning "Queen of Cats"
Read Kate's "Pro Tips" in Catification!! Drawing on their extensive human/feline relationship expertise, Galaxy and Benjamin here offer an indispensible guide packed with more than fifteen fun DIY projects and countless design tips and tricks. • What your kitty’s behavior is trying to tell you-Catification provides the meanings of ear and tail and whisker positions, as well as body language. • How to determine your cat’s specific personality and desires-Catification comes with a worksheet with questions to help determine the needs for EVERY cat in your household! This beautifully designed, full-color book includes practical and attractive projects—from kitty hammocks and “catios” (cat patios) to cat towers and superhighways—that will make both human and kitty happy. Catification is FAR from just being a "picture book." I was completely blown away by not only the AMOUNT of information in this book, but there is everything from finding the perfect cat bed, to creating the purrfect space for your cats while keeping an eye on your BUDGET! By designing an optimal living space for our feline friends, owners can minimize cats’ negative behavior and promote a healthy lifestyle for their pets, all while maintaining a beautiful home. Catification is 304 INFORMATION PACKED PAGES that should be a part of EVERY cat owner's reference library. It would make a great "new kitten" gift, a gift for a shelter, or for any cat lover in your life! A special thank you to Jackson, Kate and Tarcher/Penguin for allowing me to have a give-away for my readers!!!! 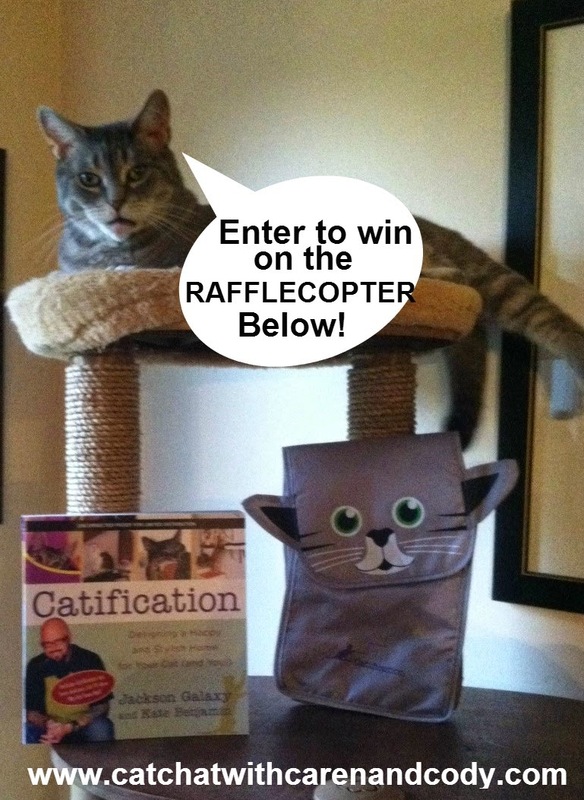 The give-away includes a "proof" copy of Catification, AND an adorable LUNCH BAG that looks like, who else? CODY!!!!! THERE WILL BE TWO WINNERS!!!! OPEN WORLD-WIDE!! YEP! WORLD-WIDE! I will mail the International winner their copy of Catification and the lunch bag and Tarcher/Penguin will mail the same prizes to my winner in the U.S.!!!!!! Entering is "Easy-Peasy!" there is only ONE requirement on the rafflecopter at the END of this post! For every copy of Catification pre-ordered, the publisher Tarcher/Penguin will donate $1 to organizations supporting cat welfare. We will be sure to update you once the organizations have been chosen. In order for your pre-order to count toward the donation, please email a copy of your receipt to catificationbook@gmail.com.More details at www.tarcherbooks.com/catification. Pre-order your copy now on Amazon , Barnes & Noble, from any major bookseller, or visit Indiebound to find a local bookstore in your area. I was not compensated for this review. I was sent two "proof copies" of Catification and 2 lunch bags in exchange for my honest review. It looks like a great book, Caren. Well, that didn't last long, and gradually more and more (and larger/taller) cat condos were added, a gazillion cat-related toys, "caves," etc. Now my main living space is almost entirely given over to Nicki and Derry and sometimes I look at it and think that I'd really like to have a space that works for both human and cats. I won't enter the draw, but I'll keep my eye open for it. It's not one for an e-reader, it's one that should be had hard-copy, obviously. BTW, a number of bloggers have added shelves and ramps, etc. in their living space and done an awesome job, so kudos to them! I've not attempted it because (a) I'm not handy and (b) I would want it to look, well, chic. Others seem to manage, but I lack the "chic" gene. LOL. You need to enter!!!! It's open WORLD-WIDE silly woman!! It is a fabulous book!! I know what you mean about the cat items taking everything over, that's exactly what they mention in the book and one of a zillion reasons why this book is just superb. You should enter! Oh and I am DEFINITELY lacking the "chic" gene! Sounds like a grreat book ! We've had the pleasure of seeing the book and it is FANTASTIC!!! Please don't enter us though...we want everyone else to have a chance! This looks like a really awesome book! My human does not catify our house anywhere NEAR enough! I know there has got to be lots of fun in that book! Oh wow, this sounds like a pawsome book. Our mama has done loads of things to keep us happy and healthy but there is so much more we would like for her to do. We wants one of those sky bridges! Yes! I'd love to win this book to get more ideas to use at PAWS. Looks fab and good luck to all the entries. Have a super Saturday Caren and Cody. My cats would be into this giveaway, but I'm not going to give them any ideas about changing up our home to a cat house, so no, I'm not entering. It is bad enough they steal our dog beds. I have to retain control here as the dog of the house. Wow - what a totally cool book. I think catifying a house is a wonderful idea.....I'm sure this book has tons of super ideas in it and we'd love to win it! Hugs and thanks for the fab review! Sounds like a great book. When Little One started getting older, we started making things easier for her to get to the places she always enjoyed relaxing in. Didn't realize we were catifying the house, neat. I love the rope bridge. Catzowey! Thatza DEEEziner insight fur sure! I'd be purring more if my house certifiably catified. How cool!!!! Sounds like a great giveaway! I just won one, so I will leave this for the others. Cool! I need this book! I bet this is a great book with some awesome ideas. Thanks for the chance to win. Have a great weekend. Yay, we entered too! What a great giveaway, Caren & Cody! Thank you! Have an easy Sunday. We loved Jackson's first book and would love to have this one, too so the mom can make our house more cat friendly! We don't see a Rafflcopter, so could you please enter us into the giveaway? Very cool! This book sounds awesome. May cats always seem to be pretty happy, but I would love to find out more things I could do for them. Thanks for having such a neat giveaway!